Lifting off at the exact moment set for the launch of Flight VA240, Arianespace’s Ariane 5 begins its ascent from the Spaceport with four Galileo navigation satellites. The Galileo constellation increased by four spacecraft today following an Ariane 5 launch from the Spaceport in French Guiana – bringing the total number of European navigation satellites orbited by Arianespace to 22. This afternoon mission, designated Flight VA240 in Arianespace’s launcher family numbering system, was performed from the Spaceport’s ELA-3 launch zone, with Ariane 5 deploying its four passengers during a mission lasting 3 hours, 55 minutes. 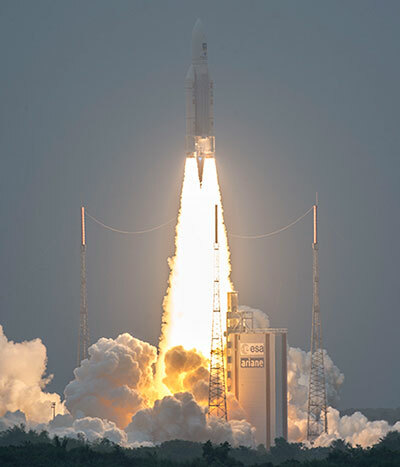 Flight VA240 was the second to utilize the workhorse Ariane 5 – supplied by production prime contractor ArianeGroup – in lofting operational Galileo satellites. It followed another four orbited by Arianespace on an Ariane 5 in 2016, and 14 others launched in pairs aboard the company’s Russian-built Soyuz vehicles during seven missions performed between 2011 and 2016. Today’s launch wrapped up another successful year of activity for Arianespace, as noted by Chief Executive Officer Stéphane Israël during comments from the Spaceport. “Thanks to the year’s flawless operation of our launch vehicle family – six Ariane 5 flights, two with Soyuz and three by Vega – our track record for 2017 is once again outstanding,” he said. Flight VA240 was Arianespace’s 11th mission in 2017, and wrapped up another busy year of activity for the launch services company. The four satellites carried on Flight VA240 were named after European children who created artwork in a Galileo drawing competition on the themes of space and aeronautics. As a result, the latest navigation spacecraft in Galileo’s constellation are called Nicole, Zofia, Alexandre and Irina – named after youngsters from the European countries of Austria, Poland, Portugal and Romania, respectively. For Flight VA240, the four Galileo satellites weighed approximately 714 kg. each, and were deployed from a dispenser system that released the passengers in two sets during an interval of 20 minutes. The Ariane 5’s overall payload lift performance to medium Earth orbit (MEO) was set at 3,283 kg. The spacecraft were built by prime contractor OHB System in Bremen, Germany, with the payloads for each satellite supplied by U.K.-based SSTL (Surrey Satellite Technology Ltd), which is 99% owned by Airbus Defence and Space. As Europe’s own global navigation satellite system, Galileo is operated under civilian control, offering guaranteed high-precision positioning around the world. The Galileo program is funded and owned by the European Union. The European Commission has overall responsibility for the program – with Flight VA240 performed by Arianespace on behalf of the European Commission under contract with the European Space Agency (ESA). Following today’s launch, the GSA (European GNSS Agency, in charge of managing and operating the EGNOS and Galileo satellite navigation systems for the European Union), became responsible for operating these satellites after their separation from the launcher. Satellite positioning operations and system operation will be carried out in conjunction with ESA. Looking ahead to next year, Arianespace’s 2018 launch activity will begin on January 25 with an Ariane 5 mission to geostationary transfer orbit (GTO). This mission will carry two relay satellites: SES-14 for the Luxemburg-based operator SES; and Al Yah 3 for Al Yah Satellite Communications Company, located in the United Arab Emirates at Abu Dhabi. 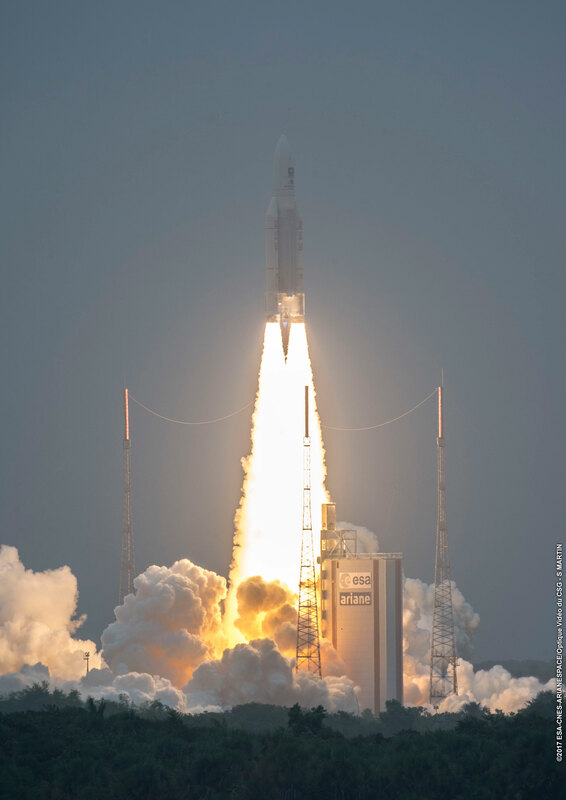 Read Arianespace’s press release on Flight VA240.